It will be difficult to escape the eulogies to Fidel Castro (1926-2016) from the British Left. Jeremy Corbyn’s take is perhaps most significant though. Treading a tightrope between his enthusiasm for old-fashioned socialist values and the reality of modern politics in Britain, his observations are revealing. He makes the very dangerous relativistic argument that whilst in Cuba, as in other regimes, there have been ‘excesses’, we have to look at the positives such as the healthcare system and education. There has been much change in Cuba, he says, and that economic progress must go hand in hand with human and free-speech rights. Above all, he says that Castro, “will be remembered as a champion of social justice”. 10 US presidents threatened to oust Castro and failed. Corbyn finds this impressive. It could have something to do with the fact that Castro didn’t exactly stand for election very often. In 1961, two years after he took power in the Cuban political revolution, he declared that “The revolution has no time for elections”. That’s usually called a dictatorship! It is in this context that Castro intervened politically in Africa, even if his activity in Angola did play a part in the ending of Apartheid, and let’s not forget that the World came within a hair’s breadth of nuclear war in the stand-off known as the Cuban Missile Crisis in 1962 as a result of the shift in power in the Caribbean. States bring war, always. Most notoriously, lesbians, gays and trans. people continue to be persecuted in Cuba and although there is anti-discrimination employment legislation, discrimination is rife in public sector policy. Transgender people in particular are effectively criminalised if they attempt to medically transition privately (even though it is almost impossible to gain access any other way: only 5 legal transition operations are performed each year). The great Cuban educational system does little in practice to reduce the level of hate crimes. What is rather surprising is that Corbyn visited Cuba three times including cycling around it with his son. How lovely! Didn’t he see the shocking levels of urban and rural poverty? Did he think that the reason not many people criticise their government to tourists is because might be because they are too afraid to? Of course anarchists have no sympathy either for the wealthy Cuban exiles who have fled Cuba for the US over the years and today are dancing in the streets of Miami, let alone the CIA and other parties in their sometimes farcical attempts to assassinate Castro. The real historical heroes were the ordinary people who stood up to the regime of the previous dictator Fulgencio Batista y Zaldívar. 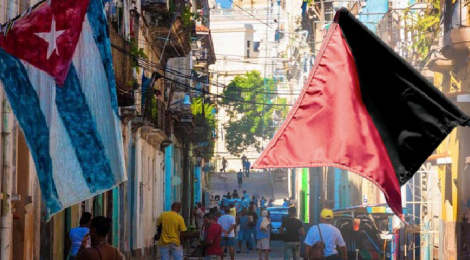 Cuban anarchists have been in the picture since the nineteenth century and suffered repression under regimes of all colours historically and currently for standing up against both capitalism and the state, and in favour of freedom of speech and organisation. The AF played host to a tour by one group attempting to organise safely, the Observatorio Critico Cubano in 2015 and they attended the 10th Congress of our International, IAF-IFA.